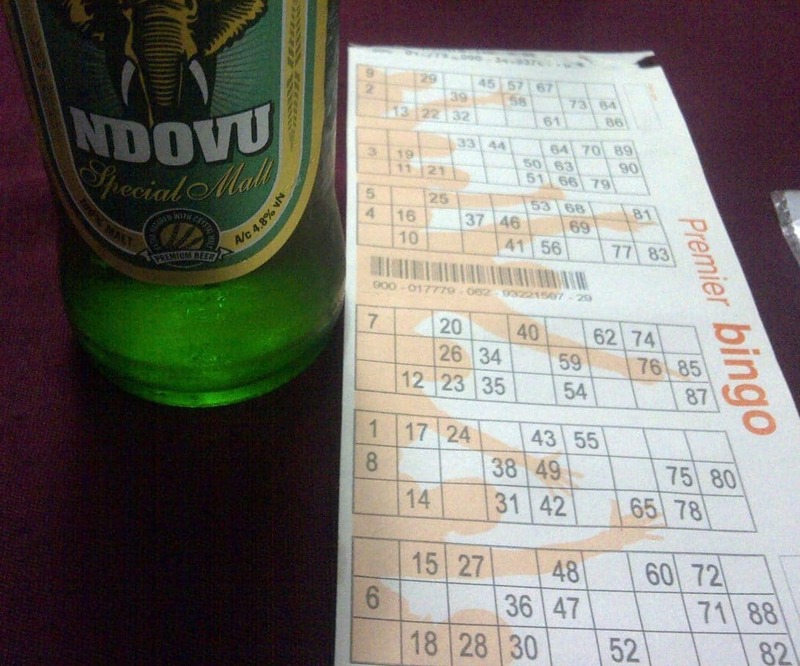 Of all the things you might expect to do in Dar es Salaam, I’m pretty sure you don’t have playing bingo on your list. What would you say then if I told you that there is a super-fun bingo night every Friday at a very unexpected place? That’s what I’d like to tell you about today. I first heard of this bingo night while working as a community coordinator at one of Dar es Salaam’s foreign missions. As community coordinator, I organized activities that would enable newly arrived diplomats to discover the city and to rub shoulders with local communities. When several people told me that “Indian” bingo at Upanga Club was a lot of fun, a light bulb went off: this could be just the kind of activity my colleagues would like. I arrived at Upanga Club alone (because I couldn’t convince any of my friends to spend a weekend night playing bingo) at around 8 p.m. on a Friday night. My preliminary research had told me that this would be the time around which the event would begin. Because the club is members only, catering to a very select community, I was a bit apprehensive at how I’d be received. Feigning confidence, I walked up to the door of the club where I found a man seated behind a small table. I told him that I was there for bingo. He must have seen through my facade because in an unusually warm and welcoming manner, he explained what was required to enter the club that night and told me more about how the evening would unfold. Most importantly, he told me that the entrance charge was Tsh. 2,000 for an initial bingo card (cards for subsequent rounds would be sold before each round began with the price increasing as the night proceeded) and that the game would begin at 9:30 p.m. In the meantime, he continued in his friendly manner, I could go in and have food and drinks while I waited for the game to start. I was pleased by the warm reception—it sure made me feel a lot more comfortable. Following his guidance, I headed to the bingo area. In the foyer, since I had a lot of time to kill, I scanned the notices and the cricket pictures on the wall to get a better sense of what Upanga Club was all about. Upanga Club is a social sports club that caters mainly to Dar es Salaam’s Indo-Tanzanian community. It was no surprise to me, therefore, that once I entered its courtyard, I saw multi-generational Indo-Tanzanian families having leisurely Friday dinner. At one end of the courtyard, there was a brightly lit bar; at another, there was food being served. I quickly found a table, not wanting to call too much attention to myself and, within no time, waiters had arrived to take my order for food and drinks. I have been to Upanga Club’s bingo night a couple of times now, and that’s something that I have always noticed: the service is both fast and friendly. A quick glance at the menu told me that I could pick from not only a wide selection of Indian food but also burgers, pizzas, and other fast foods. 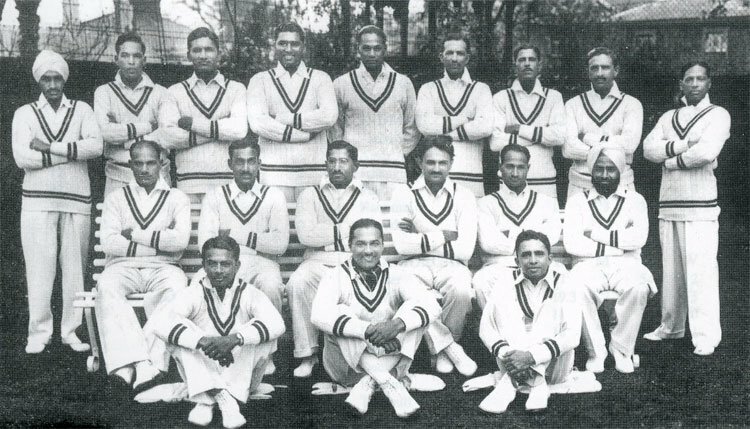 Although, I had heard that the Indian food was excellent—this I can vouch for–that night I opted not to have a meal but rather to simply have drinks from their well-stocked bar. Meanwhile, I took advantage of the time I had before the game began to people watch and to examine the scene around me more closely. As I said, there were multi-generational Indo-Tanzanian families with young kids in tow having a leisurely Friday evening out. There were young men at a few tables taking full advantage of the well-stocked bar. As it got closer to game time, tables of white expatriates—young and old—begin to show up too. It was an easy, relaxed atmosphere. Or at least it was before the game began. Once that happened, all food service stopped and everyone focused on only one thing (or at least that’s what they should have been doing): bingo. I had last played bingo in kindergarten, so I was a bit unsure of the rules of the game. If you, like I was, are not familiar with bingo, here’s a quick primer. 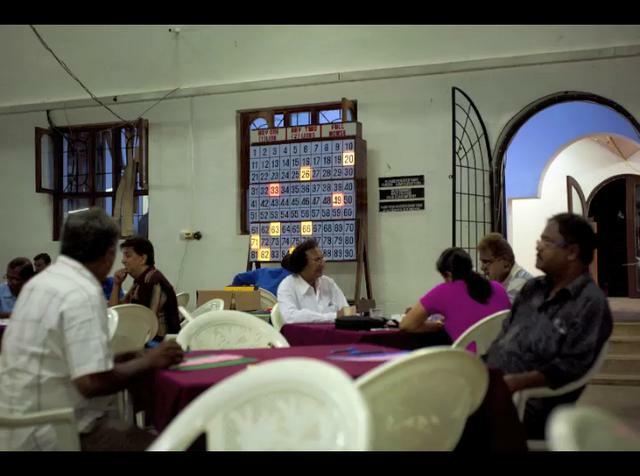 For starters, the bingo played at Upanga Club is the version of the game played in the Commonwealth—not American bingo. In essence, each player has a card with the numbers 1 to 90 on it, arranged in six 9×3 grids (these grids have empty boxes but all the numbers 1 to 90 appear once on each card). A caller then calls out random numbers between 1 and 90, and the players mark off these numbers on their cards as they are called out. When the marked numbers form a specific configuration, such as having all the numbers in one line of the card marked off, or the numbers in an entire 9×3 grid marked off, the player then calls bingo. The first person to achieve the specific configuration mentioned at the beginning of the round wins a prize. That’s basically it but you can find more details here. With my bingo card in hand (along with a clipboard and pen provided by the club), I was all set for my first round of “Indian” bingo. As the caller called out numbers, I crossed them out on my sheet. Instead of being discouraged, by the third game, I was completely engrossed, so much so that I was in complete agreement when the caller threatened to throw some rowdy guys out of the club for disrupting the game. READ ALSO: Red7 (with Card Game Rules): A Card Game Engaging Enough Even for Adults. Finally, in the third game, I won something (and boy was it a rush! ): Tsh. 50,000 for a full house (all the numbers in a 9×3 grid marked off). I quickly yelled “Bingo!”, went to get my card verified, and walked out of the club before I could be tempted to gamble my winnings in yet another round. I finally understood that day how gambling can be so addictive! 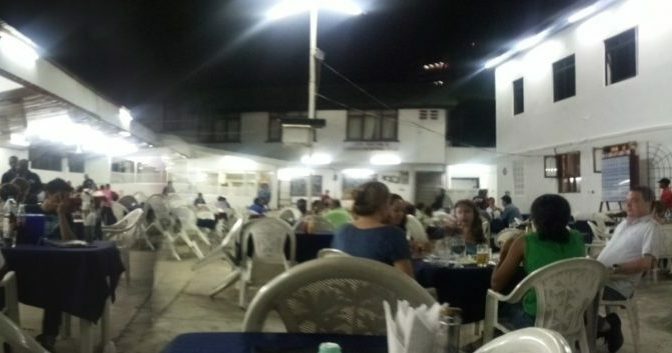 If you are interested in doing something new and unusual in Dar es Salaam, in an easy and relaxed atmosphere, while eating great inexpensive Indian food and sipping on drinks, then I wholeheartedly recommend the Friday night bingo at Upanga Club. 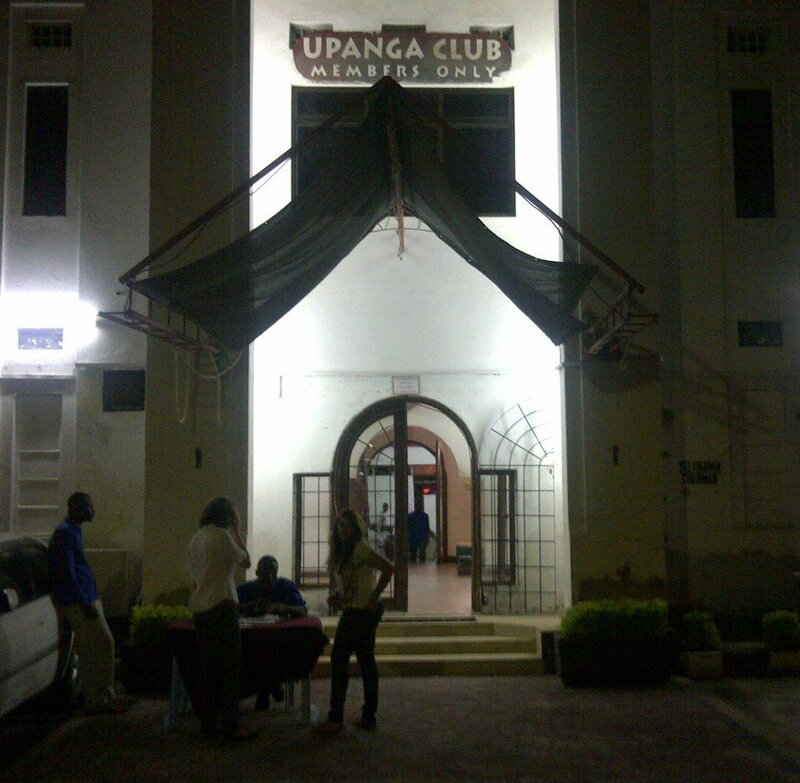 The Upanga Club is located on Ali Hassan Mwinyi Road near the Commonwealth Dar es Salaam (Upanga Road) War Cemetery. Bingo begins at 9:30 p.m., but no food is served during the game. If you would like to take advantage of the wide selection of delicious, authentic, well-priced Indian food, then be sure to get there early. P.S. Did you enjoy this post? If so, I would appreciate you sharing it on StumbleUpon, Twitter, or any other social network using the share buttons below. If you would like to know whenever I publish a new post, you can subscribe to this blog here. You can also find me on Twitter or Facebook. See you there! Welcome to ChickAboutTown & thanks for letting me know you liked this post! Did you ever make it out to Bingo night yourself? If so, I’d love to know what you thought of it. Hi- this is great 🙂 i am organising a social for my team – is it definitely every Friday? Do you need to book? I have attempted to contact them but no response! Thanks in advance – oh and how was the food? Welcome to Chick About Town. I can’t say for sure that it is every Friday because I haven’t been in a while. That is how it used to be though. I’ve never had to book, even with large parties. There is a lot of space…just get there early. Have you been trying to reach them today? Perhaps they are unavailable because of the public holiday. Try again tomorrow, otherwise perhaps it might be wise to go there in person and check before Friday. About the food, it is amazing! It’s some of the best Indian food I have had in Tanzania and very inexpensive. I hope you are able to have your social there as planned. Let me know what your experience was like after the fact.